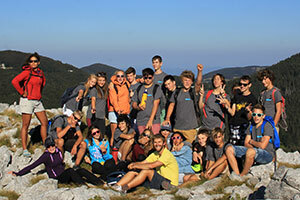 The Teen Adventure programs are unique and challenging experiences for campers 14 to 17 years of age. Teens participate in a variety of outdoor activities while exploring the beauty of the region and making new friends from around the globe. The Camp California staff, along with the reliable activity specialists help to make Teen Adventure Programs the adventure of a life time, filled with fun and exhilarating activities like rappelling, kayaking, caving, rock climbing, mountain biking, sailing, backpacking, snorkeling and much, much more. The first few days of any Teen Adventure Program gives our campers the opportunity to get to know each other through a variety of team building challenges. They will also receive introductions to the variety of activities they will be participating in over the course of the session. Once on the road, our teams of 21 campers and 4 counselors will be visiting a variety of tourist destinations and adventure areas. Teens will have the opportunity to assist staff with preparing their own meals as well as setting up and taking down the camp sites each day. Evenings will be a time to relax around a campfire, enjoy music, playing games or visiting some of the region’s most beautiful towns and villages. Accommodation varies from tents to dorms or hostels depending on the location and weather. Teen Adventure is developed to be an active and fun-filled holiday for teens. Our program gives Teens the freedom and security to make new friends, learn new skills, gain independence and confidence and improve their English through our “Living Language Program”. Camp California offers three experiences to chose from with different levels of physical challenges, adventure and independence. This program has something for everyone! See you in Croatia!